The below excerpt from the Sacramento Bee was sent to me from g-rob...Thank you Rich! “The National Weather Service noted on its website today that since 1878 in Sacramento there have been 25 months of February with an inch or less of rain. The following March in 23 of those 25 cases was wetter than usual. The average March precipitation following the dry months of February was 2.54 inches, forecasters stated. If the Truckee area gets lots of snow next month (March)...What is this phenomenon called? I'll be at the Pleasanton FFing Show, 24th-26th...next week-end. I'll be in the Truckee Guide NetWork booth, E-10. Also, I'll give presentations entitled "Tahoe-Truckee Fly Fishing Opportunities" on Saturday & Sunday. Come by the booth and say hello. For me this is party...seeing lots of friends. 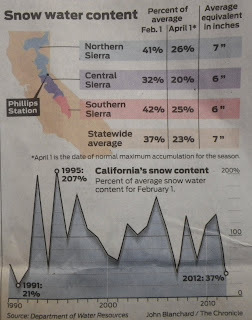 "...15.6 inches of snow at Phillips Station near the entrance of Sierra-at-Tahoe Ski Resort...snow contained the equivalent of 3.8 inches of water, just 19 percent of the long-term average for snow at the survey site...measurements make 2012 the second driest year for the site since the Department of Water Resources began keeping records in 1946. Last year at this time...28.4 inches of water in the snowpack at Phillip Station, more that seven times what was on the ground this week. ...We have good reservoir storage thanks to wet conditions last year... Mark Cowen, Director of the Water Resources..."